I have never understood why this record has always been so overlooked and severely underestimated. Even in the tons of praise heaped on Can in recent years the cursory mention given to the solo recordings of Can members tends to ignore or dismiss this fantastic disc. During Can’s later years the influences of dub and ‘world’ music watered down the unhinged aggression and sheer naked artistic intent of their earlier recordings. However, here those influences give the record a hue, rather than sloppily splashing gaudy colour all over the place. The zany professor tendencies which Holger exhibits to occasionally irritating effect in his solo work are reigned in here as he has to restrain himself in the context of his collaborators. 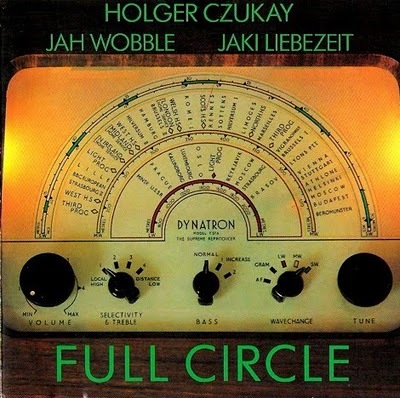 Reading between the lines of the statements made about this collaboration by all concerned it seems that Wobble’s relationship with Czukay and Liebezeit wasn’t totally harmonious. Maybe this is the reason why there is a distinct lack of the mawkish sunniness which ruined later Can records, although the fallout from Jah Wobble’s involvement in PIL’s ‘Metal Box’ is also a major factor. Whatever the reasons, there is definitely a darker, more sinister edge to this record than anything the Can members had recently recorded. Holger Czukay at Inner Space and Conny's Studio. "How Much" recorded and mixed by Mark Lusardi in London. Editing and processing by Holger Czukay at his laboratory. music * hertz, what happened to all the posts since August 2012? I came here for the Sonny Sharrock/Material live post, but it's gone -- as is everything from the last several months. Did I misnavigate? Thanks for the music. All (well most) of the posts will come back at some stage when I get round to uploading them. The Material live will be up tomorrow. Very nice to have you back, sir! Do you have Laswell's "Havana Mood" by any chance? I do, will post soon.